Formerly one of the most ethnically diverse cities in the country, and today suffering geographical division of ethnic groups, the city was the most heavily bombed of any Bosnian city during the war in Bosnia and Herzegovina following the breakup of Yugoslavia. At the beginning of the war, air strikes destroyed many important buildings and structures, damaging the city historical core. The Old Bridge, a symbol of Mostar was damaged first by JNA forces during 1992, and on 9th November 1993 utterly destroyed by Croatian Defence Council tanks positioned on Hum hill after two days of heavy shelling. Mostar has been most famous for this beautiful historic Ottoman-style bridge, which spanned the Neretva river in what is considered the historic center of the city. Through combined efforts with the international community, rebuilding of The Old Bridge was completed in 2004, almost 11 years after its destruction, using some of its original pieces recovered from the Neretva river. A significant portion of the city has been rebuilt and visitors might be surprised to see that this formerly war-torn city is a lively and beautiful destination once again, particularly the area within and around the old town. However, many visible signs of Mostar's troubled recent history remain. There are two bus stations in Mostar: the main station next to the train station on the Bosniak (Muslim) part of the city and the bus station on the Croat side of town. Most buses stop first at the main station, which is in walking distance to the historic old center. Bus timetables are online. Frequent buses run between Mostar and Sarajevo (2,5 hours, almost every hour, 20KM), Ploče, Dubrovnik (2 per day, 3-4 hours, 30KM), Split (4 hours, 125 HRK), Zagreb, Podgorica, Jajce (3,5-4 hours, 19KM ), Banja Luka, Belgrade (2 per day) and most cities in Bosnia and Herzegovina. The journey from Sarajevo to Mostar is quite scenic after passing Konjic where you can see Lake Jablanica and Neretva river when sitting on the right hand side of the bus in the direction of travel. Note that the stop in Mostar for the bus from Podgorica, which continues to Banja Luka, is several kilometres from the city center on an expressway. A taxi from there costs 10 KM. Train timetables are online. Trains run between Mostar and Sarajevo (2 per day: 07:01 and 14:26). Since 14 th of December 2014, there are no more direct trains to Zagreb and Ploce. The scenery on the train ride between Mostar and Sarajevo is stunning, passing through rugged terrain with a series of tunnels, U-turns and viaducts. It is much more picturesque, as well as cheaper, to travel between these cities by train (one-way ticket costs 12 KM, 07:01 departure, supposed 2 hour journey, although expect 2.5hrs) rather than by bus. However, the facilities of the train stations are rather dated. The train itself is a newer Talgo unit, and is suitably comfortable and air conditioned. 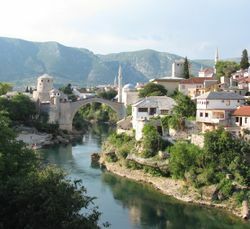 Mostar is easily reachable from Western Europe via Croatia. From Zagreb take the A1 motorway towards Split (green signs for Karlovac and Split), and after passing Split continue driving until you reach the border crossing. The motorway than continues for 10 kilometers into Bosnia and Herzegovina. Then just follow the signs to Mostar on the remaining 40 or so kilometers of two-lane road. There are plans to build a motorway all the way to Mostar, but this might take several more years. From Sarajevo it's a two-hour scenic drive through the Neretva river valley. This route is also planned to be upgraded to a motorway. Mostar International Airport (IATA: OMO) is located in the village of Ortješ, 7.4 km south southeast of Mostar's railway station. There are seasonal flights to destinations in Italy including Rome, Naples, Bari, Bologna. The Bosnia and Herzegovina Convertible Mark (BAM/KM) is pegged to the Euro at a rate of 1 EUR = 1.95583 BAM. Shops and restaurants will accept Euros at a 1 EUR at 2 BAM (Bosnian KM) and Croatian kuna is also widely accepted in Mostar at 1 BAM = 4 HRK. Numerous banks have their affiliates and ATM machines across the city. Most restaurants in the Old Town will accept cards and there is ATM machine next to tourist company across Restaurant Kulluk and Europa. From 2016, fast and free Wi-Fi provided by TGM is available in the vicinity of the Stari Most ( Old Bridge ). Many of nice lounge bars are located in the Old Town. 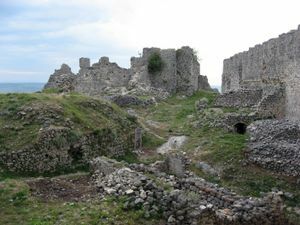 Many of these areas are hard to reach with public transport; however, several agencies such as Discover Herzegovina Day Tour, Herzeg Day Tours offer guided tours. 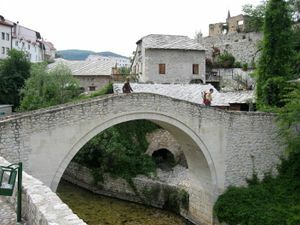 Pocitelj - a well-preserved walled Bosnian town dating back to 1383 that is 35km south of Mostar. It is reachable by public transport by taking yellow bus #41 towards Capljina for 45 minutes. Excellent view of the Neretva River. During the Middle Ages, Počitelj was considered the administrative centre and centre of governance of county Dubrava župa. The town has a few small restaurants, coffee shops and street vendors selling local grown fruits and souvenirs. Blagaj - a village 12km southeast of Mostar. It is reachable by public bus 10 in 15 minutes (2.25 KM, stops in Spanski TRG in front of the gymnazija). The bus may leave from the road opposite the main station, not the bus station itself. At Blagaj, a karst river flows out of a mountain. It's very beautiful, with deep blue water. A historic mosque is built into the cliff. Women must wear headscarves to enter the mosque. Trout are farmed in the river, and several excellent restaurants serve trout with seating on the riverbank. There is an impressive ancient fort with amazing views on top of the mountain. Follow the road past the village's "old town" and then ask where the trail starts, or just follow the road (keep right) to where the road swerves left (you'll see several ancient gravestones) and you'll find the path on your right. The trail is about 2 km. There are numerous campsites in Blagaj directly adjacent to the Buna river. Elagicevina (the Velagic family House) was built in XVII century and is a beautiful example of the Ottoman residential architecture, a one-story structure with typically extended porches. In the vicinity there are also old flour mills that were in the old days powered by the strong River Buna. There are two guesthouses including Ottoman Villa Velagomed Hotel. Medjugorje, 25km from Mostar, is popular among pilgrims due to an alleged apparition of the Blessed Virgin Mary to youths in the town. Buses depart from the bus station every few hours. Stolac - an old Ottoman town with the medievil cemetery of Radimlja, the Illyrian site of Daorson and the palaeolithic cave painting at the Badanjsko Cave. Drežanka gorge, 25km north of Mostar, is popular for outdoor sports such as biking, hiking, canyoning, and climbing. The Drežanka river is a tributary of the Neretva, and the two rivers join in an artificial hydropower lake. Take a bus in the direction of Drežnica - there are buses which go all the way to the end of the gorge, Gornja Drežnica. Or take the train in the direction of Sarajevo and get off at train stop Drežnica, approx 30 min. There are several camp sites and basic accommodation, although you will need your own sporting equipment. Ploče, Croatia - is the nearest seaside town to Mostar, and is easily accessible with numerous buses daily. Beaches are nicest for swimming north of the city. This page was last edited on 19 October 2018, at 17:55.